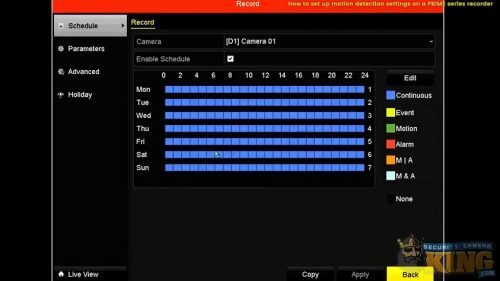 The purpose of this article is to help out anyone looking how to set up motion detection settings on a PRIME Series Recorder. 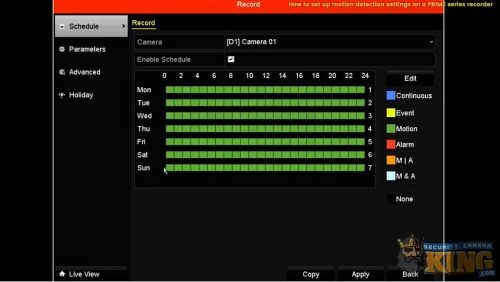 We will go over the motion detection settings through the local interface of your recorder. 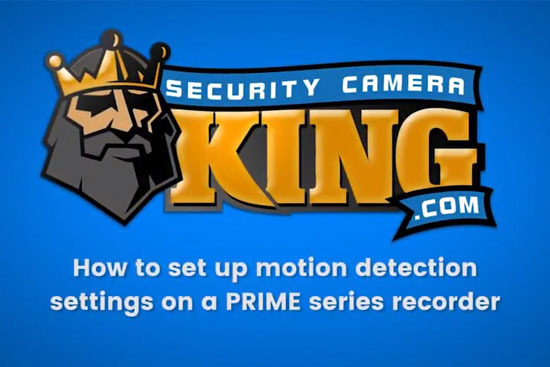 If are interested in a PRIME Series Recorder, or want more information on any PRIME Series products we have available, visit our website here: Security Camera King. And you can also read our recent article on choosing the best wireless security camera system in 2018. Okay. 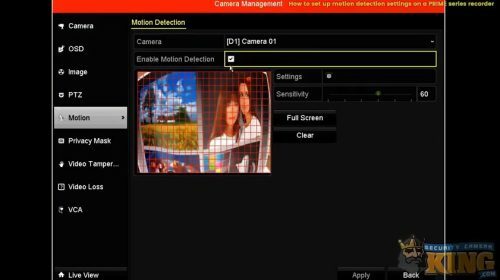 Let’s begin the tutorial on how to setup motion detection settings through the local interface of a PRIME Series Recorder. Go ahead and right-click on the screen with your mouse and select the Menu option. Once the Menu comes up, locate the Record option in the bottom left-hand corner. Left-click the Record option. After selecting the Record option, you should see the Record Schedule. If it is still set to the default settings, you should see that it is set for continuous recording on Monday through Sunday. Notice that any boxes in the Record Schedule that are marked blue are set to Continuous, as seen here. To modify this, select the Edit box on the right side, just above where it says Continuous. From here, you can turn everything (all channels and all cameras) to Motion. Select the drop-down box towards the top that reads Continuous. Once selected, go down one option and select Motion. In order to copy it to all channels, select Copy on the bottom of the menu options. Check the box next to All. After you have selected All you should see a check in each of the numbered boxes for every channel. If so, select Okay. Once you have selected Okay, select Apply at the bottom. Then select Okay again. At this point, you will notice that your entire Record Schedule is green. Green is the color used for Motion in a PRIME Series Recorder. Now let’s create a custom Record Schedule. If you are interested in creating a custom Record Schedule, select the Edit box on the right side once again. Next, uncheck the All Day box selection. 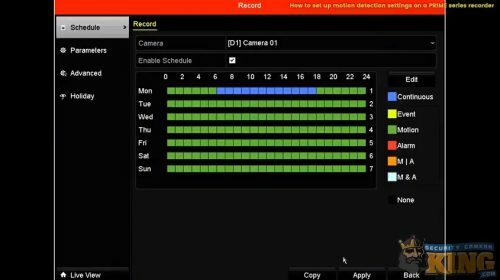 Here you can start putting in the custom hours you wish to have the motion detection feature enabled or Continuous recording. 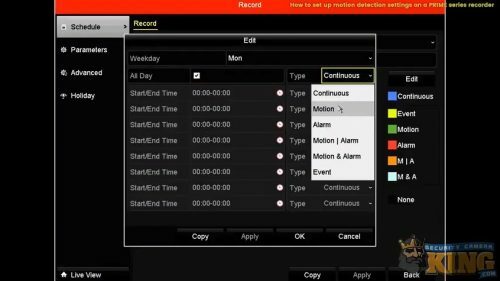 For example, if you want Continuous recording during business hours, but Motion enabled after hours, this is how to do it. 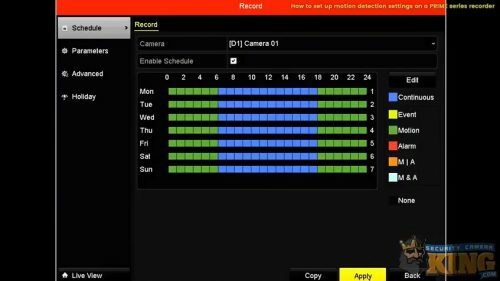 Just put in your desired hours, which type of recording you wish, and then select Apply. Then select Okay. As you can see, this only created your custom Record Schedule for Monday. 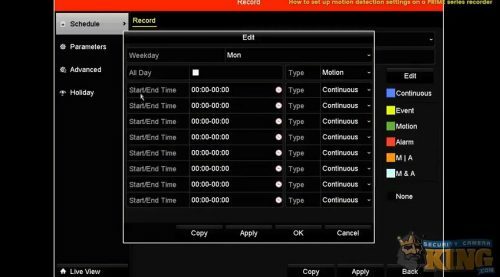 If you wish to make this custom Record Schedule for each day, go back into Edit. Then select Copy and check the box for All Channels. Select Okay. Then select Apply, and Okay once again. 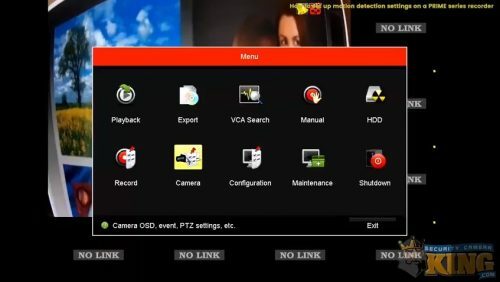 If you want to make sure the Motion Detection feature is enabled on your PRIME Series Recorder, return to the Main Menu. Enter your security pattern. Then select Camera. While in Camera, select Motion in the menu on the left. You should see a white box located next to Enable Motion Detection. Make sure the box is checked. If you are interested in some additional settings, then click on the wheel next to Settings. Here you have the options for Trigger Channel, Arming Schedule, and Linkage Action. The Trigger Channel lets you record multiple channels when one camera senses motion. Arming Schedule is the active time. And Linkage Action will let you do things such as send emails and trigger alarm outputs. To learn more about those settings or to follow along with this tutorial, watch the video provided below. 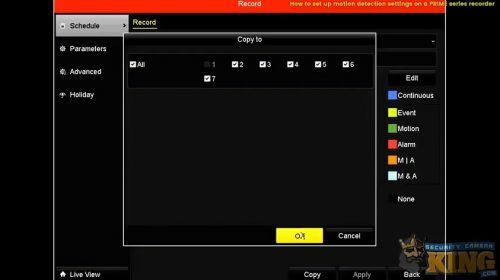 We hope that this information has been helpful for anyone wondering how to set up motion detection settings on a PRIME Series Recorder. 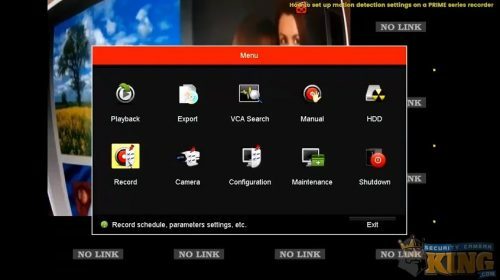 Be sure to check out our other related security articles, security camera videos, DVR / NVR videos, located in our Video Vault. And visit our website to look at our entire collection of PRIME Series products. USA Support Team is our complete source for any technical support issues and customer service solutions. Their staff members have an expert knowledge of our products, provide troubleshooting assistance, walk-throughs, offer various tutorials, and help with all other technical support and customer service issues. And their entire, award-winning team is located right here in the USA. Digital Security Guard does remote video monitoring for locations across the nation. They provide business, corporate, and residential surveillance options at highly competitive rates. These rates are significantly lower than a traditional private security agency that employs manned security guards. They work with local law enforcement and emergency response teams to develop a proactive security plan and offer 24/7 or custom protection plan options. eLine Technology is one of the nation’s top CCTV suppliers and is involved in the process of designing, manufacturing, and distributing CCTV equipment. Their relationship with security camera and surveillance equipment distributors is one of the primary factors that allows us to provide our products at wholesale prices. TechPro Security is a professional installation team that specializes in security systems, alarm systems, and access control equipment. They are located in Boca Raton, FL and travel throughout Florida to help clients get the most from their systems. Contact them if you are in need of a professional installation team or want installation tips for any of your systems. Security Camera King distributes a wide range of different security cameras, video recorders, and other related surveillance equipment. Our Boca Raton, FL and Wheat Ridge, CO locations have allowed us to help meet the security needs of anyone in the country. You can find all of the products available in our PRIME Series collection, along with our other featured series, available on our website here. If you have any questions about any services or products discussed in this article, call us toll-free at 866-573-8878 or click here: Contact Security Camera King.